Heat oil along 1 tablespoon sesame oil in a non-stick skillet over medium-high heat. 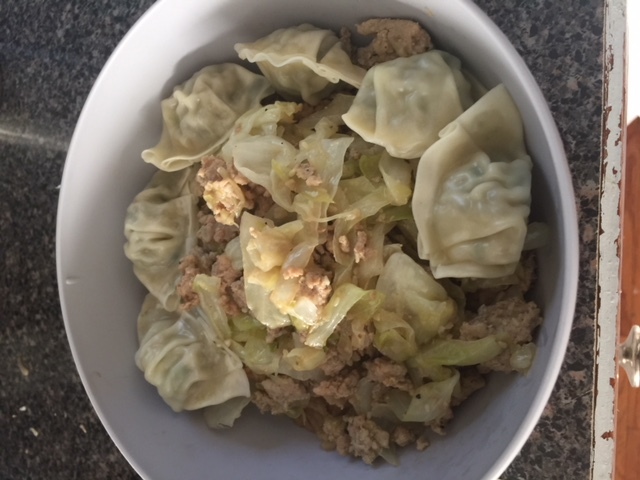 Add the ground turkey, cabbage, white onion, garlic, ginger, salt and pepper and cook until turkey is no longer pink and cabbage just starts to stick to pan. Stir in the remaining sesame oil and add rice vinegar sesame seeds, soy sauce and green onions stir, taste and adjust seasoning. I like serving this meal with rice and wontons. Wontons can be purchased at Costco.